Since I first reviewed the Goldtouch Go mobile ergonomic keyboard in 2012, it has been upgraded to a new version, the G02. When I requested this latest model for review, the company considerately included one of their mobile laptop stands as well. Since these accessories are marketed together, it seemed logical to review them in the same post. When you first look at the new Goldtouch Go, everything seems pretty much as before. Its compact layout is separated into two halves, which are connected by a locking ball joint. The keys are laptop-style to facilitate a light, thin, compact body. In short, it’s a portable version of the keyboard that defines Goldtouch. But there’s something different. This thing folds, and I don’t just mean the halves flatten for storage. 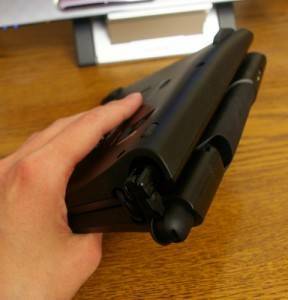 It actually folds all the way over onto itself, making a compact package to stick in your laptop bag. I never would have thought this was physically possible, but some Key Ovation engineer evidently did. To fold the Goldtouch Go, you must first open the locking handle, then slide the Unlock switch on the back of the unit, while at the same time pulling the two halves apart. 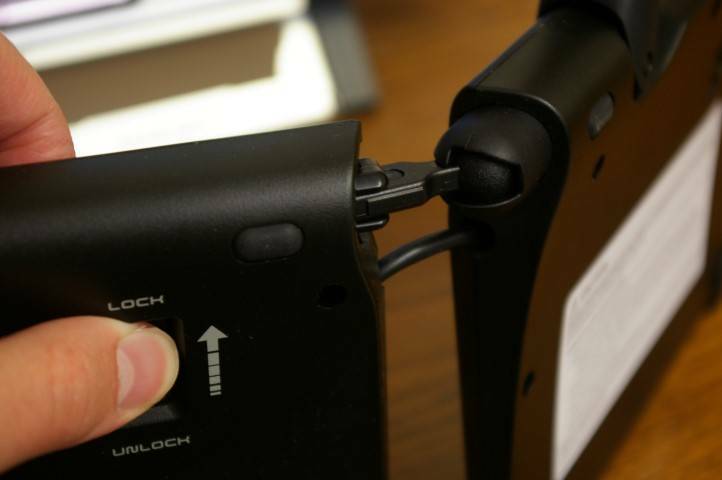 Once the joint between the two is open, you can release the Unlock switch. The keyboard will now freely fold in half. After the locking lever is re-engaged, it will remain securely in that position for transportation. Reverse the procedure to put the keyboard back together as before. The really elegant thing about this new folding mechanism is that it eliminates the sliding key protector plates, two easily-lost plastic parts that used to encumber the Go. Since the two key surfaces now fold against one another – exposing only the hard back of the unit to the world – the keyboard is in a sense its own carrying case. The only possible downside I see here is durability. The pivot and locking mechanism consists of small plastic parts with significant potential leverage on both sides. I can’t imagine it would take much carelessness for something to go crunch during folding or unfolding. The keyboard feels solid when fully assembled or fully stowed, but I sense a need for caution during the in-between steps. The Goldtouch Go is Bluetooth enabled, which means more than receiver-less connectivity with many modern laptops. It also means easy mating with most tablets and even smartphones, which makes this keyboard one of the few real ergonomic choices for non-computer activities such as text messaging. I tested the Go’s Bluetooth capability on three different devices, two of them using the inexpensive Goldtouch Bluetooth dongle for lack of native Bluetooth support. On my Ubuntu laptop it worked, but got squirrelly after a few minutes of use. In fairness, this probably says more about hardware support on Ubuntu than it does about the Go’s wireless reliability. My Windows 7 desktop computer has no issues with it whatever – in fact, I’m using the Go + dongle setup to write this review. My cell phone, an old HTC Droid Incredible, stubbornly refused to recognize the Go at all. To the credit of Key Ovation’s email support tech, he pursued the issue until he determined that my particular cell phone model has known Bluetooth problems. He even pointed me toward a firmware fix that might get it working. I didn’t have time to try this solution, but I was impressed with his thoroughness. There’s no need to worry about batteries for your Goldtouch Go. Like many new wireless devices, it has an internal battery and charges via USB. The unit can be used while charging, though the cable could stand to be a bit longer in my opinion. As discussed in my previous review, the Goldtouch Go is designed so that it can sit up on top of your laptop keyboard while in use. This will work with most standard-size laptops, and in theory it sounds great. After a few minutes of trying it in practice, however, I gave up. While I was able to get the keyboard positioned – with some trial and error – even a slight jar could get one of my keys accidentally depressed and held. This made me tense while typing, which is both unergonomic and bad for my new novel. Even if the Go worked flawlessly in a literal “lap” context, this use case isn’t optimal. (iPad neck, anyone?) Instead you should try to find a desktop or table where you can use your laptop with the Go keyboard and an external mouse. 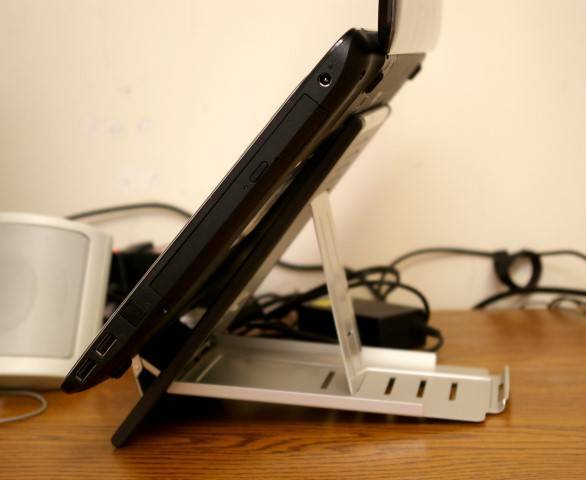 For this you also need a laptop stand to put your screen near eye level. Since the Goldtouch is the first portable laptop stand I’ve tried, I have nothing for comparison. However, its one-pound heft is reasonable, durability seems good, and it folds down to fit nicely in an included 8″ x 10″ neoprene sleeve. The stand’s foldout mechanism is simple enough that I was easily able to set it up without looking at the instructions. I did overlook the slide-out width adjusters, but the stand supported my 14-inch Toshiba just fine without them. As you can see from the picture at right, eye level at my current desk is near the highest of the six angles available. The stand holds my laptop securely in this position, and I have no complaints. Overall, I consider the folding Go to be an improvement from the original version. Combined with the right accessories, such as a sturdy and compact laptop stand, it’s a solid choice for ergonomics on the road. I’m glad that Key Ovation is continuing to innovate with their mobile product line, and I look forward to seeing what they’ll create in the future.